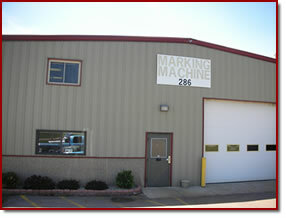 Marking Machine Company, conveniently located in Tekonsha, MI, supplies everything in metal marking at an economical price! Our Marking Devices, dies and marking machines are quality products produced by skilled craftsmen in our modern factory. Our service is complete from tool room through engraving - to final heat treat, We take pride in making rush deliveries to meet your requirements. E-mail or phone us for complete information and a quotation on anything in the metal marking field.